Prompt: Imagine that you are President of the United States. Pick one issue today where you believe America’s founding principles guaranteeing equal rights for all citizens are not being fully realized. Write a speech you would deliver as president urging Americans to correct the injustice. Presidents are often inspired and informed by the ideals and accomplishments of previous Chief Executives. 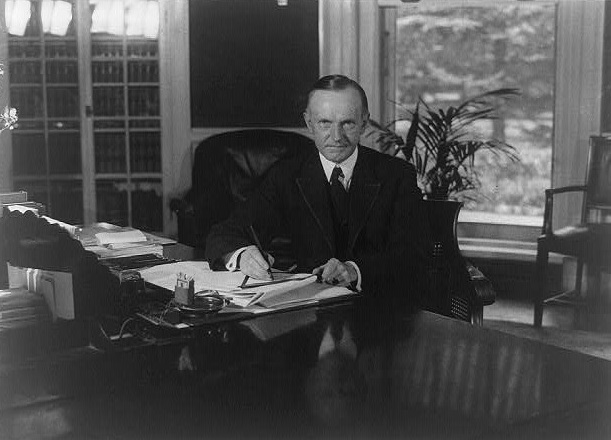 In your speech, you must use examples from President Calvin Coolidge’s life and beliefs. Research can be found on this page. Your speech must be 800 words or fewer. The submission form is at the bottom of this page. The first place submission will receive $1,500 and the runner up will receive $500. Deadline to submit: May 11, 2018. To be eligible to compete, the contestant must be a current resident of the state of Vermont or attend school in Vermont. Contestants must be at least 13 years old but younger than 20 by May 11, 2018 (open to students aged 13 to 19). Writing submissions must contain 800 words or fewer. The submitting author may have a teacher or mentor provide feedback on a draft, but the submission must reflect the author’s own original thinking and writing. Background: America’s founding documents recognize that all individuals possess certain inalienable rights. The U.S. Constitution establishes a system of government designed to protect these rights for its citizens. It is important to realize that citizens’ rights do not come from the government, but rather are protected by the government. The first 10 amendments to the Constitution, known as the Bill of Rights, as well as, additional amendments and numerous laws seek to ensure individual rights are upheld. It is important that the law not discriminate against certain individuals or groups, but rather treat all citizens equally. In instances when rights’ protections are not being applied equally among citizens, there is said to be a civil rights abuse. About the Calvin Prize for Vermont Youth: The Calvin Prize for Vermont Youth is a prize named after President Calvin Coolidge and his son, Calvin Coolidge, Jr. It is for writers ages 13 to 19 currently living or attending school in the state of Vermont. The first-place prize of $1,500 and the runner-up prize of $500 are awarded for submission that best addresses the prompt of this year’s prize. The winners will be invited to attend and be honored at the Coolidge Foundation’s annual summer gala in Plymouth Notch, VT in early July 2018. The Coolidge Foundation is grateful to the Young Writers Project for its partnership in the Calvin Prize contest. Please download, complete, and upload the media release (below this form) along with your submission.